For over six years Cathy and her family have been battling Myelodysplastic Syndrome (MDS). On January 9, 2018, Cathy had a bone marrow transplant. This process involves extended stays in the hospital and ongoing medical treatments. Dayspring has created the Hartig Transplant Fund to help offset mounting medical costs. See below for several ways you can contribute and support the Hartig family. PayPal is simple and secure. 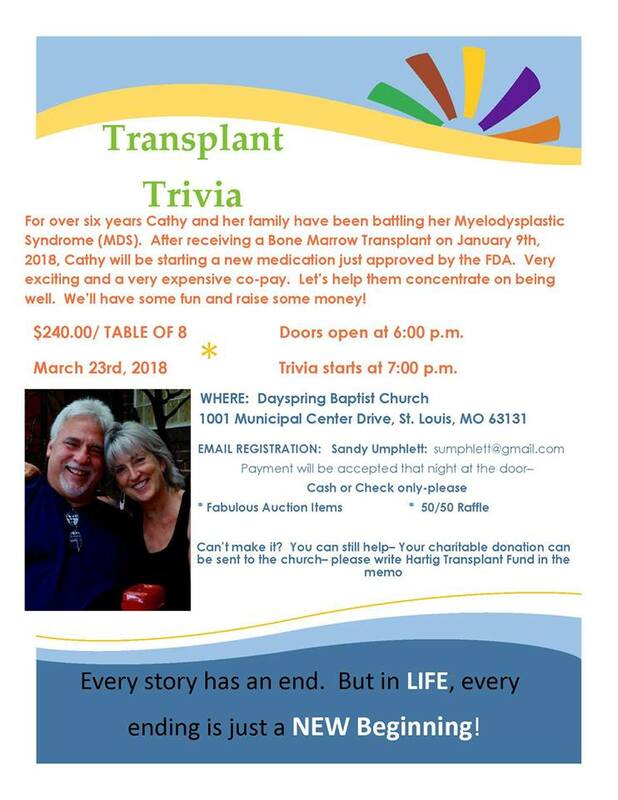 Be sure to designate your gift to the Cathy Hartig Transplant Fund by filling in the appropriate box. Simply follow the PayPal button below to get started. You can send donations directly to our church office at the address below. Be sure to note they are for the "Cathy Hartig Transplant Fund."